On January 30, 2019 the task meeting of OSMU Rector Maria A. LIVZAN and the Governor of Omsk Region Alexander L. BURKOV took place. The Governor congratulated her on taking the office and suggested discussing some issues of specialists’ training and human resourcing in public health. 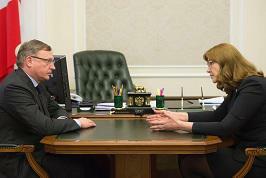 Maria A. LIVZAN noted that the University is fully engaged in solving personnel problems and works side by side with the Ministry of Public Health in Omsk Region, in particular, with the Minister Dmitry M. VYUSHKOV. Together with the Ministry of Public Health and deputies of the Omsk Legislative Assembly OSMU has set up the project “Exact Start”. Five rural areas will participate in it. OSMU has already chosen 18 school leavers for employer-sponsored education. The results of this project will go before the governor.